Fat Crabs Rib Company has two menus: one for seafood so fresh it tastes like the ocean and the other menu for barbecue and fixings that smack of the South. 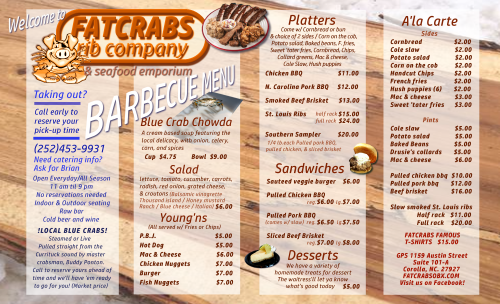 At Fat Crabs Rib Company in Corolla NC, you will find only the freshest local Outer Banks seafood. If you order from the seafood menu, feel free to enjoy a combination dish of oysters, shrimp, white fish, scallops with fries and hush puppies. And you’ll love the homemade blue crab chowder — you can search the entire Outer Banks, but you’ll not find anything quite like the Fat Crabs seafood menu. Or try the soft-shell crab sandwiches and get a pound of peel-and-eat shrimp. There’s enough here for everyone. Grab steamer pots and fixings to go! Steamers come with corn on the cob, red bliss potatoes, sweet onions, lemon, garlic, spices, homemade cocktail sauce and butter. All items are available for takeout, and if you call ahead, you can try some of the local blue crabs caught right here in the Currituck sound. 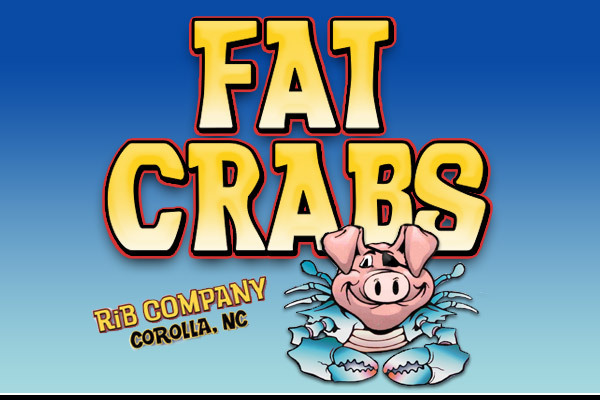 Fat Crabs Rib Company is a throwback to what great beach bars and restaurants used to be, and the steamed clams, oysters, crab, and mussels are always fresh and perfectly cooked. We’re not fancy here at Fat Crabs Rib Company, but the seafood is incredible. 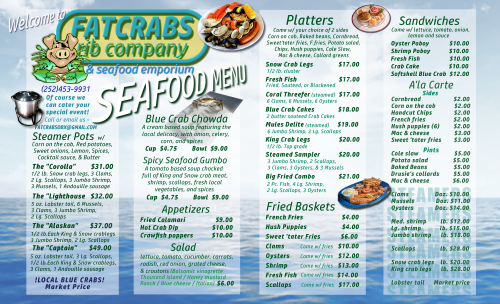 Try the jumbo steamed shrimp with the spicy cocktail sauce, or pick up an Alaskan steamer pot and broiled crab cakes. You might find that you need to come a few times to make it through both menus at this classic Corolla NC restaurant. Custom Steamer Pots Made To Your Taste!